Scene From The Other Side - Chris Petit from White DolphinFilms on Vimeo. Brilliant profile of film director Chris Petit in conversation with Allan Bairstow. Truth and invention, real lives and fiction become indistinct and equal elements, merging with other people's work in the found-footage style, to create a single fabric of random spontaneous expressiveness, not unlike the life that slides by in front of a shop video camera. Each piece of film presents a clue to an inextricable tangle to which everything in the world is connected in its spider web of time, space and chance. Chris [Petit] was much taken with [critic Manny Farber's] writings on American cinema of the 1940s, and with the way in which Farber could notice a detail in a movie, a moment, a glance, and celebrate the beauty and complexity of just that. The narrative was largely unimportant, but the way an actor like Robert Mitchum moved, or the way Bogart looked up just before crossing a street, these were the things that Farber believed were significant. So Chris made a film essay about these ideas that is a road trip across Arizona and Nevada and California, and through the psyche of American cinema. It's a documentary in which the road becomes a movie, just as it did for Wenders and so many others. It's about film and about memory, as well as about the way we mis-remember movies -- and life -- all the time. It's a television programme that's also about photography (the Polaroid frame is a key device) and about painting. It's about Rossellini and Godard, and about Europe and the USA. And it's a sort of a love story too, between the filmmaker and his travelling companion. There are so many things to like about negative space: the ways in which it interrogates sequences and the surfaces of the cinema image; its complex, half-heard and half-recalled soundtrack; the sense of nostalgia for cinema, and for a particular studio-based cinema from a specific historical moment; the unexpected beauty of small-town America in both the 1940s and the 1990s; its analysis of physical and psychological and cinematic space; the bold, deliberate provocation of a film made for television that breaks most of the rules; and then at its centre, the rueful, wise and fragile Manny Farber, filmed so informally by the director on a camcoder that sometimes you wonder if he ever looked through the viewfinder. Film Studies For Free's author has been doing a little research on the wonderful work of British filmmaker and video essayist Chris Petit. It seemed only proper, therefore, that she should share the excellent online and freely accessible sources she came across in the process -- including the remarkable documentary embedded above - with this blog's faithful readers. If you are specifically interested in Manny Farber, subject of Petit's brilliant 1999 film for television negative space (someone, anyone, please release this film on DVD! ), then you should also check out yesterday's FSFF post. an ambient 21st century road movie that is essay rather than fiction, drift rather than destination. It is a film about life in the rearview mirror, memories of other journeys (Poland to Texas), the You Tube generation and email seduction. It is also about driving into the flatlands of late middle age, about fathers and sons and growing up in the cold war, about genocide and political assassination, and the postwar landscapes of Europe and the USA. Content will be screened again in early March at London's ICA. If you live in or near that city, you can see two of Petit's feature-length films for free at the BFI Southbank Mediatheque (Radio On  and London Orbital , co-directed by Iain Sinclair). Well, looky here at this, says Film Studies For Free: a remarkably rich and informative, hour-long discussion about the work of legendary American film critic Manny Farber. And there's another, half hour shorter documentary embedded at the foot of this post that tackles the subject of Farber's painting, and places it in the context of his film-critical work, to a certain extent. FSFF adds to the experience by providing some links to other choice scholarly material about Farber. Readers might also like to revisit FSFF's monumental links post The Value of Style: Film Criticism in Scholarship. [The video package about Manny Farber begins eleven minutes in]. Learn about two men who are helping to put San Diego on the art world's map: Hugh Davies, director of the Museum of Contemporary Art San Diego, and local painter Manny Farber. In the studio with Gloria Penner are: Stephanie Hanor, Assistant Curator, Museum of Contemporary Art San Diego, and Robert Pincus, Art Critic, San Diego Union-Tribune. Short documentary by Louise Lambert (2005) about Bill Morrison's experimental collage film Decasia (2002). You can also read David Cairn's great entry on this film for the Film Preservation Blogathon here. Further articles on this film are listed below. Film Studies For Free is very honoured to contribute an entry to the "For the Love of Film! Film Preservation Blogathon". As FSFF readers will already know, this highly worthwhile event has been organised by greatly esteemed bloggers Self-Styled Siren and Marilyn Ferdinand (the latter of the wonderful Ferdy on Film). Below are embedded some entertaining and informative online videos about film preservation, and below those are some links to further, openly accessible, scholarly material about this essential but expensive art and science. If you would like to make a donation to the Blogathon's chosen charitable recipient, the National Film Preservation Foundation (U.S.A), one of the most active and important preservers of film anywhere in the world, please click here. The National Film Preservation Foundation is the independent, nonprofit organization created by the U.S. Congress to help save America’s film heritage. They work directly with archives to rescue endangered films that will not survive without public support. The NFPF will give away 4 DVD sets as thank-you gifts to blogathon donors chosen in a random drawing: Treasures III: Social Issues in American Film, 1900-1934 and Treasures IV: American Avant Garde Film, 1947-1986. So you can see for yourselves the important work that the NFPF does, here's the list of films it has helped to preserve so far. If you would like to contribute to the cause of film preservation in a country other than the U.S. you can find details of all national affiliates to the International Federation of Film Archives (FIAF) via FIAF's online directory here. 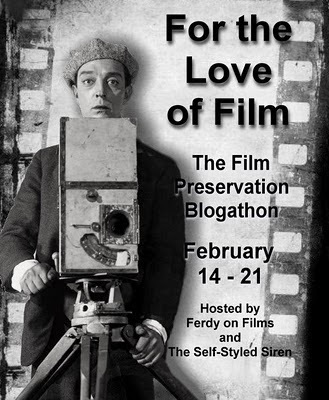 To access a list of all entries to the "For the Love of Film" Blogathon to date please click here. If you need further inspiration to donate or otherwise get involved in this cause, do watch Greg Ferrara's wonderful video commercial for the Blogathon at his website Cinema Styles. A great introduction to the practicalities of film preservation (with a terrifically entertaining voiceover). It looks at the preservation of Humphrey Jennings and Stewart McAllister's 1942 film Listen to Britain at the British Film Institute archive. Treasures of the Academy/"Guardians of History" Documentary Channel/Academy of Motion Picture Arts and Sciences produce an in-depth look at the importance of film preservation. John Huston's World War 2 documentaries, "Battle of San Pietro" and "Let There Be Light," which have been preserved by DOC and AMPAS, are highlighted as examples of film as living history. Featuring interviews with John Huston's son, Tony, and top directors and historians who shed considerable light on this important, exciting subject. Parts 2 & 3 below. A sad reminder of the extreme end of celluloid's ephemerality through neglect: "Spectacular footage of 1937 Fox Film storage facility fire in Little Ferry, NJ - Digital/upload by F. Fuchs Filmed by W. Zabransky. Theda Bara and other FOX films/negatives were destroyed." Caroline Frick, an expert of film conservation, is founder and executive director of the Texas Archive of the Moving Image (TAMI) and assistant professor at the University of Texas at Austin. In this [ten minute long video] interview, hosted by Luis Figueroa, she emphasizes the importance of film preservation and mentions how the growth of the film media has had a positive influence in the development of this art of conservation. Film Studies For Free was so inspired by Jim Emerson's excellent essay 'Avatar, the French New Wave and the morality of deep-focus (in 3-D)' at his blog Scanners, that it decided to speed up production and publication of its long-in-preparation list of links to openly-accessible scholarly material of note on cinematographic depth of field, focus, and related matters of sound design and staging. Thanks Jim! Readers might also like to (re)visit FSFF's posts on 3D Studies, phenomenological film studies, film music and sound, Orson Welles and Avatar. Some of Film Studies For Free's favourite bloggers, the Self-Styled Siren of the eponymous blog and Marilyn Ferdinand of the wonderful Ferdy on Film (along with Greg Ferrara of the ever so stylish Cinema Styles) have been involved in launching and whipping up deserved support for a Film Preservation Blogathon' aptly titled 'For the Love of Film'. It will begin next Sunday, on Valentine's Day appropriately. And the idea is for as many people as possible to join in, either with relevant posts on their blogs and/or by reading said posts and contributing financially to the cause of film preservation. The fine folks at the National Film Preservation Foundation have really gotten into the spirit, lending us photos and clips from films that their efforts have saved. Do have a look. And they have also arranged for a DVD giveaway, to be distributed after the blogathon via a drawing from those who have contributed to the fund. Because of course, the important part is to contribute to the NFPF. Film preservation is an extremely expensive process, and our goal this Valentine's Week is to help along their good work with as much money as we can give. The link to their donation page is right here. If everyone who visits these blogs the week of February 14th kicks something, anything, into the kitty, we could be responsible for saving even more films. And wouldn't that be much, much better than the usual run of sad bonbons and wilted bouquets this time of year? Now FSFF appreciates sad bonbons and wilted bouquets as much as the next sappy blog, but this is a worthy cause indeed! Do visit the Siren's website to see which topics have been proposed so far (including one by the very blog you are currently reading...). Those of you on Facebook can check out the Blogathon's activities there, too. Film Studies For Free was extremely impressed by the quality of the above presentation, one of a number of excellent papers (all now online) given at the latest Video Vortex conference in Brussels. [In t]he past two years, the [Video Vortex] conference series - which focuses on the status and potential of the moving image on the Internet - has visited Amsterdam, Ankara and Split, growing out into an organized network of organizations and individuals. Time for an interim report, perhaps. [VV] asked some participants of the first Video Vortex editions and publication, as well as new ones, to reflect on recent developments in online video culture. Over the past years the place of the moving image on the Internet has become increasingly prominent. With a wide range of technologies and web applications within anyone’s reach, the potential of video as a personal means of expression has reached a totally new dimension. How is this potential being used? How do artists and other political and social actors react to the popularity of YouTube and other ‘user-generated-content’ websites? What does YouTube tell us about the state of contemporary visual culture? And how can the participation culture of video-sharing and vlogging reach some degree of autonomy and diversity, escaping the laws of the mass media and the strong grip of media conglomerates? In the videoed paper embedded above, as in his wonderful essay 'BMW Films and the Star Wars Kid: 'Early Web Cinema' and Technology' in the 2008 collection Cinema and Technology, Andrew Clay takes an in-depth look at the current state of online cinema. He asks what will happen to web cinema as we shift from learning to see and how to feel to learning how to participate in this new electronic space of modernity? FSFF thinks that it is well worth keeping an eye on Andrew Clay's work: he is currently Senior Lecturer in Critical Technical Practices at De Montfort University, Leicester and programme leader of BSc (Hons) Media Technology in the Faculty of Computing Sciences and Engineering. A quick post, today, to give Film Studies For Free's readers something good to watch while this blog undergoes some layout changes. The above video presents a highly entertaining, and very informative, hour-long Q & A session with film director William Friedkin. The event, facilitated by Joseph Pascal, took place on February 24, 2009 at the Hudson Union Society, New York City, and was made available online thanks to the wonderful people from FORA.tv. Friedkin, director of The Exorcist and The French Connection, discusses his legendary film career. He describes his on-set experiences, and explores the past, present, and future of the film industry. As some readers will know, Film Studies For Free had a recent brush with digital oblivion as Google fleetingly tarnished its (avowedly) sterling reputation with an access warning to those clicking on links to this site over the last two days. The radical approach worked and, this morning, this tired and tremulous blog awoke to the good news that the very venerable Google (e-Zeus, as FSFF sometimes dares to call it) no longer considers it to be a plague house. We live to blog another day. Phew. Thanks so much to all of you who sent supportive messages - they were very much appreciated, and will be treasured long after recent, nasty, memories have faded. There are gonna be some changes around here, however.... So, please consider this site to be 'under (re)construction' for the next little while, as a relieved and grateful FSFF considers some layout changes, along with re-installs of and updates to its lists of permanently viewable links. If you get tired of waiting, in the meantime, for news of fabulous, openly accessible, online film and media studies resources, just follow (or visit) FSFF's micro-blogging little sister filmstudiesff on Twitter. Hasta la vista and thanks for your patience! As of late on February 5th, all of the situation set out below has been resolved: Film Studies For Free has been given the all-clear. Unfortunately, Google has reported that 'Part of this site [Film Studies For Free] was listed for suspicious activity 2 time(s) over the past 90 days'. If you have tried to click on a link to my website in the last two days, you will most likely have come across the same warning. This has not happened before on this blog, thankfully. But it has happened now and I have acted quickly to address the problem. I believe that this situation has arisen because several of the links in my sidebar blogrolls were to sites recently 'taken over' by malware/'badware'. I have thus deleted all relevant sidebar elements (apologies if my link to your website has disappeared as a result). I am now applying to Google to get the 'all clear', and if this happens smoothly, I will start to reconstruct what I have removed, bit by bit, on the basis of secure linking. If this does not immediately solve the problem, I will have to reconsider the future of this blog. In the meantime, all of the resources I have gathered together in the last 19 months are safe and seemingly 'uncontaminated' by malware. In either case, I will publish another blogpost as soon as I can in order that those hundreds of you who subscribe to this blog in a reader can at least know what's happening without actually having to visit the blog properly - and thus risk the wrath of the warning message. I will not delete the blog without further warning. In addition, you can keep in touch with Film Studies For Free's ongoing work of sharing links to openly-accessible film studies resources by following the FSFF 'microblog' on Twitter. You can also email me directly using this link. My sincere apologies for any alarm caused by this situation, and thanks very much in advance for your patience.